SEASONAL: Yes, roughly Memorial Day through Labor Day according to one web site, but I was there Sept. 21. Office: The office is not located at the campground but rather up the road a few tenths of a mile. N 46.94551 W 098.70166 marks an entrance to the parking lot you probably DO NOT want to take. It is steep. 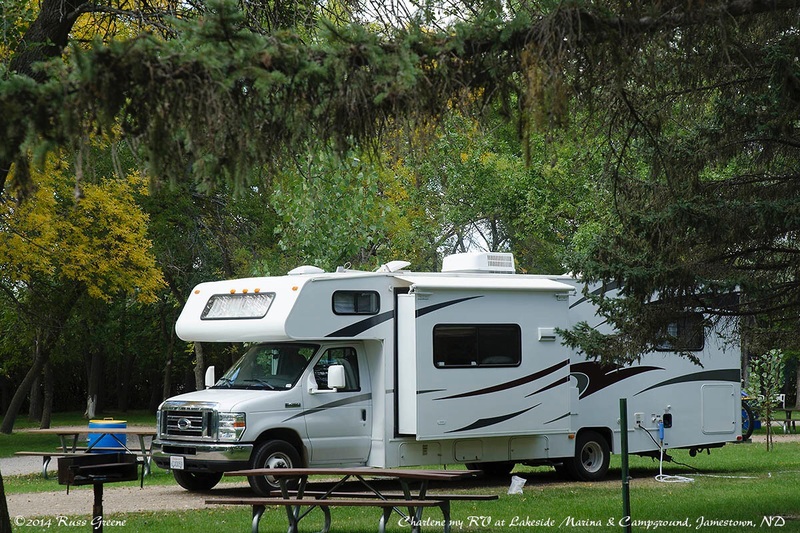 In fact, you can self-pay at the campground and don’t really need to go to the office. 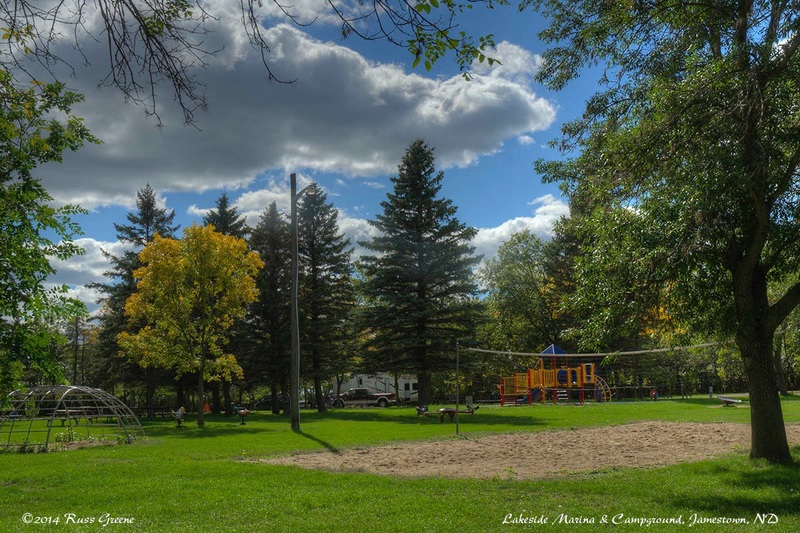 The central area at Lakeside Marina campground contains a volleyball court, monkey bars, and other things for kids to play on and in. PETS: I did not come across any regulations regarding pets. Check with the office. 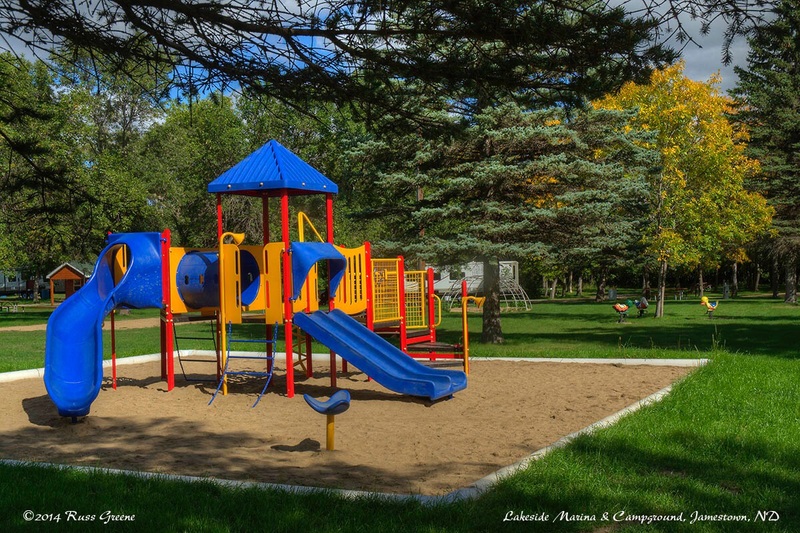 Lakeside Marina and Campground in Jamestown had one of the nicest play areas for kids that I’ve seen in campgrounds. They also had a decent volleyball court. SHOWERS: Included; $5 for non-campers. OTHER: There are several small cabins for rent in the campground. I didn’t see snide any of them but spoke to someone who was renting one. Except for a number of beds there was no furniture and no other facilities. They were paying $45 per night. There is a large sheltered picnic with quite a few tables area next to the restroom. There is a soda vending machine outside restroom building. Groceries: There’s at least one market in Jamestown a few miles away. Hugo’s I think and there may be others. There’s also a Walmart Supercenter and those usually have grocery sections. I liked this campground. I liked all the greenery, from the trees to the lawn which was well maintained. Even though I have no children of my own, or perhaps because of that, I liked the play sets on the central lawn and enjoyed watching the children at play. I don’t recall every seeing such an elaborate play set and monkey bars, etc., at another campground. In stark contrast I recalled another play set I’d seen elsewhere that seemed to be cobbled together from old worn out tires and rusty discards. 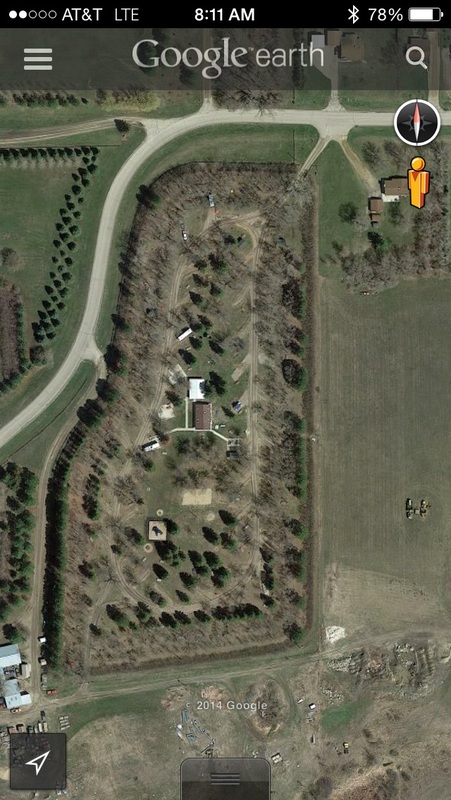 This campground is laid out in an oval around a central grassy area which is well maintained (see map). The area was fairly level and most of the campsites seemed fairly level as well. I didn’t do anything to level my rig as the site was close enough to level for my tastes. I’m uncertain of the maximum size rig that can be accommodated here and recommend a phone call to the office to inquire. I did see some pretty good size 5th wheels and trailers here. It can be a long distance to electricity and water. I had to back my RV into the site about as far as I could without running up on the lawn (photos at left and above) so my electrical cord could reach the pedestal and I had to use my longest hose to reach the water supply which was located right beside the electrical pedestal. While we’re covering things electric, an electric space heater was positioned in the restroom/shower building (men’s room) next to the shower stalls, apparently intended for campers to use when they shower as the building itself appears unheated. I could not make this heater function, however. 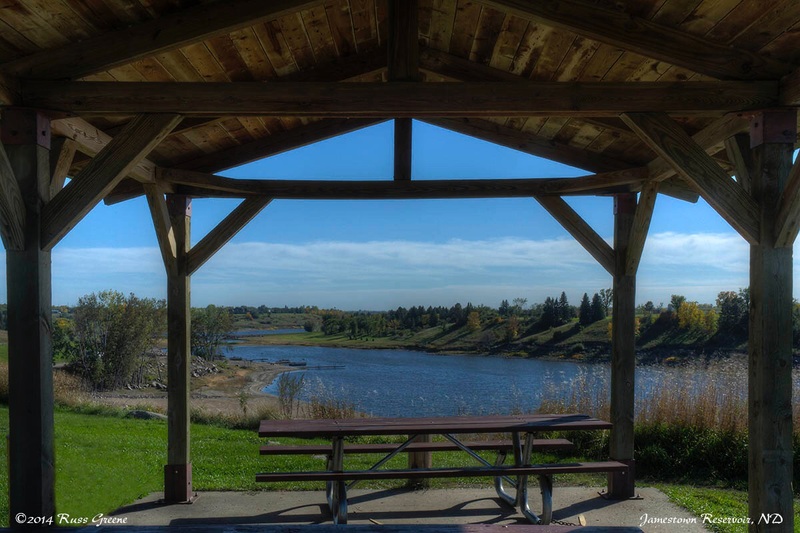 This is part of the play area at Jamestown Reservoir. 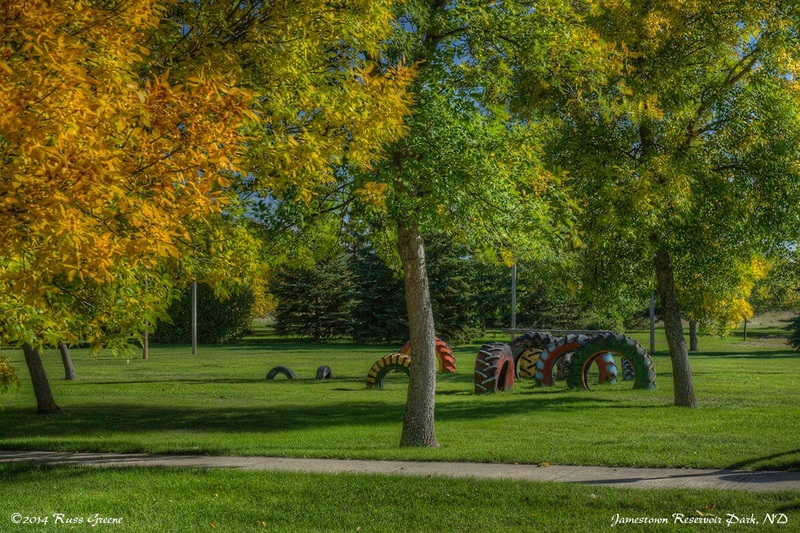 Adjacent to the campground are some absolutely lovely grassy fields with a number of picnic areas, a playground, baseball field, even a disk “golf course” which, I take it, is a game played with Frisbees. Bring your insect repellant. The mosquitos meant business. 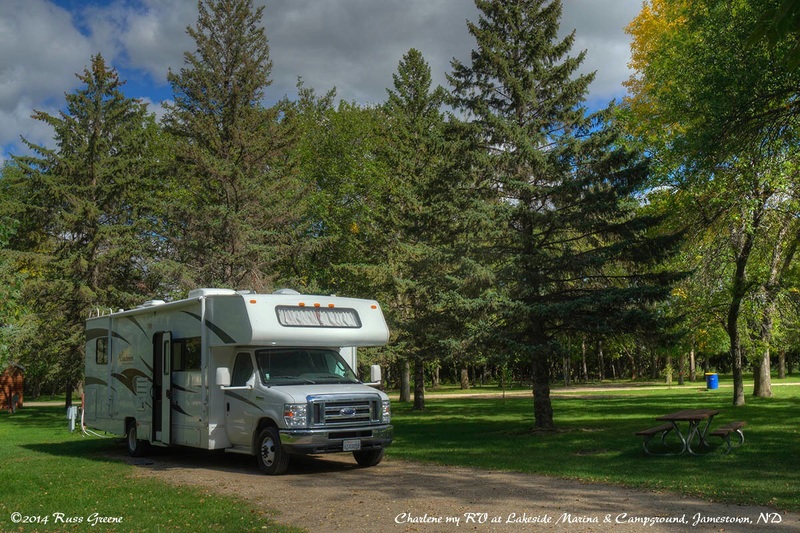 I stopped at this campground as a layover place on my way from Theodore Roosevelt National Park in western North Dakota to Minnesota where I was heading to do some leaf peeping.